On October 20, 1979, Taub Hall was dedicated to Captain James F. “Pete” Rogers and the Rangers of Company A. Mr. Henry J. N. Taub, who donated the funds for this project, was a longtime friend of Captain “Pete” Rogers and held the Rangers of Company A in high regard. James Frank “Pete” Rogers was born in Saratoga, Texas and grew up in Batson, Texas. He received his education from Lamar Tech and Texas A&M. Rogers joined the military in 1942 and was a fighter pilot in Europe during World War II. During his military service Rogers won three Distinguished Flying Crosses, twelve Air Medals and the Purple Heart. Pete joined the Department of Public Safety in 1947 as a Highway Patrolman. He became a Pilot Investigator for the DPS in 1951; in 1952 he was transferred to Lufkin. In 1958 he was promoted to sergeant in the Texas Rangers and was stationed at Company A in Houston and was later promoted to Captain of Company C in Lubbock in 1969. He then returned to Company A in Houston as Captain in 1972. A Ranger for 24 years, Pete Rogers was a blend of the old and the new. He was a skilled horseman experienced with a lariat, and a pilot with a jet rating. Famed Captain W.L. “Will” Wright joined the Frontier Battalion in 1898 and continued to serve until 1902. In 1917, after serving for fifteen years as sheriff of Wilson County, Wright was appointed Captain of Texas Ranger Company D. During prohibition Capt. Wright’s Rangers were instrumental in capturing bootleggers and smugglers. Wright resigned from the Rangers in 1939. Milam Wright, brother of Captain W.L. Wright served in the Frontier Battalion from 1898 to 1900, under Capt. John H. Rogers in Company C and was later promoted to the rank of sergeant in Capt. John R. Hughes’ Company D. Charles Wright, the eldest son of Captain W.L. Wright, joined the Texas Rangers in 1916 and served under Capt. J.J. Sanders. He resigned from the Rangers to join the U.S. Army during World War I, enlisting with the Battery D, 131st Field Artillery of the 36th Division and served overseas in France. Emanuel Avant “Dogie” Wright, the third son of Capt. W.L. Wright joined the Texas Rangers in 1918. He was appointed Deputy U.S. Marshal in 1920 and he began his long association with the U.S. Border Patrol in 1924, which lasted until 1951. 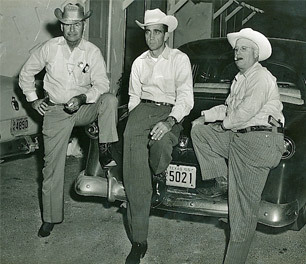 “Dogie” served as Hudspeth County Sheriff from 1953 until his retirement in 1969. William Berry “Bill” Wright, the fourth son of Capt. W. L. Wright, served one year as a Special Ranger in his father’s Company D.
Frank A. Hamer, son of Frank E. and Lou Emma Hamer, enlisted in the Rangers on April 21, 1906, serving in Captain J.H. Roger’s Company C. He worked for the U.S. Prohibition Service during 1920 and 1921 and was appointed Captain of Ranger Company C later that year. In 1922 Hamer was transferred to Austin as Captain of Headquarters Company. He retired from active duty in 1932 but retained his Special Ranger commission. In 1934 he was appointed a Special Investigator for the Texas Prison System. Estill Hamer, the eldest child of Frank E. and Lou Emma Hamer, enlisted as a Special Ranger on July 12, 1916, and again on January 19, 1933. In 1932 he was promoted to Captain of Headquarters Company upon the resignation of his brother Frank A. and held this post for two years. Estill was discharged January 24, 1935. Harrison Hamer, son of Frank E. and Lou Emma Hamer, joined the Texas Rangers on October 23, 1918, serving in Captain W.W. Taylor’s Company F, and again, in 1919 with Captain W. L. Wright’s Company D. Harrison became a Special Ranger working for several oil companies and livestock organizations from April 1927 until March 1932. He enlisted again as a regular Ranger on April 1, 1932 and served in Company D stationed at Falfurrias, Texas, until January 1, 1933. Flavious Hamer, son of Frank E. and Lou Emma Hamer, enlisted as a private in Captain Jerry Gray’s Company A on December 11, 1923. His occupation was listed as “Ranchman,” and he had no prior service in the Rangers. He was discharged on February 28, 1925. Clint, son of Harrison and Freddie Hamer, served as a Special Ranger from approximately 1932 to 1935, listing “Peace Officer” as his occupation on his enlistment papers. During Clint’s time with the Rangers he was successful in breaking up a long-time cattle theft ring in Jasper County, Texas. Frank Hamer, Jr., first son of Frank A. and Gladys Hamer, served as a pilot in the United States Marine Corps during World War II. From 1948 to 1950, he served as a Texas Ranger, assigned as a personal bodyguard for Governor Allen Shivers and his family. John Dudley, Sr., son of Robert Emmet and Margaret, joined the Rangers in 1913 and served eight months under the command of Captain John R. Hughes. From 1914 to 1916, John was an inspector for the U.S Mounted Customs Service. In May 1916 he rejoined the Rangers. On July 12, 1918 Rangers John Dudley White, Sr. and W. I. Rowe were tracking army deserters, Daniel M. Evans and Sam H. Williams, in San Augustine County. The deserters, not wanting to be caught, ambushed the Rangers, resulting in Rowe being wounded and White killed. The deserters were captured the following day, tried at Camp Davis, and sent to a penitentiary. “Doc”, son of Robert Emmet and Margaret, James joined Captain John R. Hughes’ Ranger Company D in 1905 due to a request made by James’ father, Robert Emmet White, sheriff of Travis County. In 1909 James left the Rangers to work for the Austin Mounted Police and in 1913 he served as a customs inspector for the U.S. Customs Service Office. During World War I he became a first lieutenant in the Army Intelligence Department and later joined the F.B.I. John Dudley, Jr., the eldest son of John Dudley White, Sr. joined the Special Ranger forces in 1934 at the age of twenty-three. From there he served as a Travis County deputy sheriff with a Special Ranger Commission. In 1942 he joined the Texas Department of Public Safety as a criminal investigator in the Ranger division. 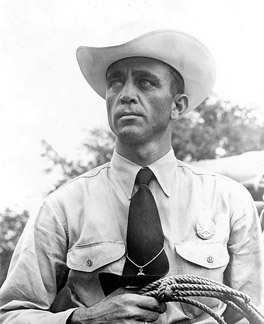 White was later promoted to Senior Ranger in 1947. During his twenty-eight years of service with DPS, he was stationed in Amarillo, Harlingen, Crystal City, Austin, Midland, and San Antonio and served in Companies C, D, F, E, and Headquarters. Tom, son of Robert Emmet and Margaret, enlisted in the Rangers from 1905 to 1909 and served under such notable Captains as John R. Hughes and J.A Brooks. He resigned from the Rangers and worked for the Santa Fe and Southern Pacific Railroads as a special agent. Tom continued his long career in law enforcement working of the Federal Bureau of Investigations from 1917 to 1927. Tom also served twenty-four years in the Federal penitentiary system as Warden for both Leavenworth and La Tuna Penitentiaries. After his retirement from the penitentiary system Tom served on a three-man board for Texas prisons and paroles. Walter Russell was born in Presidio, Texas, and grew up on horse ranches in Oregon and Arizona. During the early 1920s Russell worked as an Arizona Ranger and for the Chiricahua Cattle Company on the 3-C’s Ranch. He moved to Texas in 1930 and was employed as an investigation and security officer for the Central Power and Light Company. Russell was also a scout for the Texas Animal Health Commission from 1938 to 1941. During World War II, he served as a civilian investigator for the United States Government. In 1952 he was appointed to the Texas Rangers and assigned to Captain Alfred Allee’s Company D headquartered in Alice, Texas. During the 1950s Walter was involved with the take down of George Parr, “The Duke of Duval,” a corrupt politician. Walter’s status as an authentic Ranger on horseback brought him in contact with celebrities like Tom Mix and Walter Brennan along with western writer Zane Grey. Walter retired from the Regular Ranger service in 1967. He served as a Special Ranger with the East brothers on the King Ranch until 1975. His later years were devoted to raising horses on his Rocking “R” Ranch in Kingsville, Texas. Henry J.N. Taub Hall also features a selection of the museum’s works of fine art, including a portrait of Sam Houston, a painting depicting the Battle of Plum Creek and works by noted Texas artist Tom Lea. Taub Hall also houses a number of bronze works by noted sculptors.